270 pages | 1 B/W Illus. Human Rights, Power and Civic Action examines the interrelationship between struggles for human rights and the dynamics of power, focusing on situations of poverty and oppression in developing countries. It is argued that the concept of power is a relatively neglected one in the study of rights-based approaches to development, especially the ways in which structures and relations of power can limit human rights advocacy. 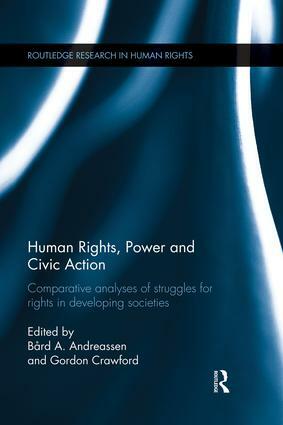 Therefore this book focuses on how local and national struggles for rights have been constrained by power relations and structural inequalities, as well as the extent to which civic action has been able to challenge, alter or transform such power structures, and simultaneously to enhance protection of people’s basic human rights. Contributors examine and compare struggles to advance human rights by non-governmental actors in Cambodia, China, Ghana, Kenya, South Africa and Zimbabwe. The country case-studies analyse structures of power responsible for the negation and denial of human rights, as well as how rights-promoting organisations challenge such structures. Utilising a comparative approach, the book provides empirically grounded studies leading to new theoretical understanding of the interrelationships between human rights struggles, power and poverty reduction. Human Rights, Power and Civic Action will be of interest to students and scholars of human rights politics, power, development, and governance. This is an important book for at least two main reasons. First, it is important because it departs from the conventional human rights discourse that has dominated the legal profession since the establishment of the international human rights regime…Second, the book is important because it is empirical in orientation, based on a common theoretical foundation: the power cube (Figure 1). The rich empirical detail based on fieldwork is illuminating. Bård A. Andreassen is Professor of Human Rights at the Norwegian Centre for Human Rights, University of Oslo. he is currently Research Director of the Research Group on Human Rights and Development at the Law Faculty, University of Oslo. Gordon Crawford is Professor of Development Politics in the School of Politics and International Studies and Director of the Centre for Global Development at the University of Leeds, UK.